On Sunday night, the first blood supermoon eclipse in 30 years will be visible from most continents on Earth where the skies are clear and there's a low-ish amount of light pollution, according to USA Today. For New York City, that part about light pollution is pretty damn hard to avoid, so where can you see the blood supermoon in New York City? There are actually a good number of places you could see it. Tonight's moon is a super special and rare event. It will be a full moon at the closest point in its orbit with Earth, making it a supermoon, and then it will occur during a lunar eclipse, which means the Earth will stand between the moon and the sun, casting a shadow on the moon, according to USA Today. Because of the amount of light that scatters off the Earth's atmosphere, the moon will appear a coppery-red color — thus the name "blood moon" — instead of being completely blacked out in the Earth's shadow. In New York, you'll be able to see the larger-than-normal supermoon as soon as the sun sets. At about 9:07 p.m. EDT, the moon will enter Earth's full shadow, and the total eclipse will begin at 10:11 p.m., according to Live Science. The total eclipse will last about an hour and 12 minutes, and then a little sliver of the white moon will start to grow. If you want to catch a good view of the supermoon from New York, here are five places to go. 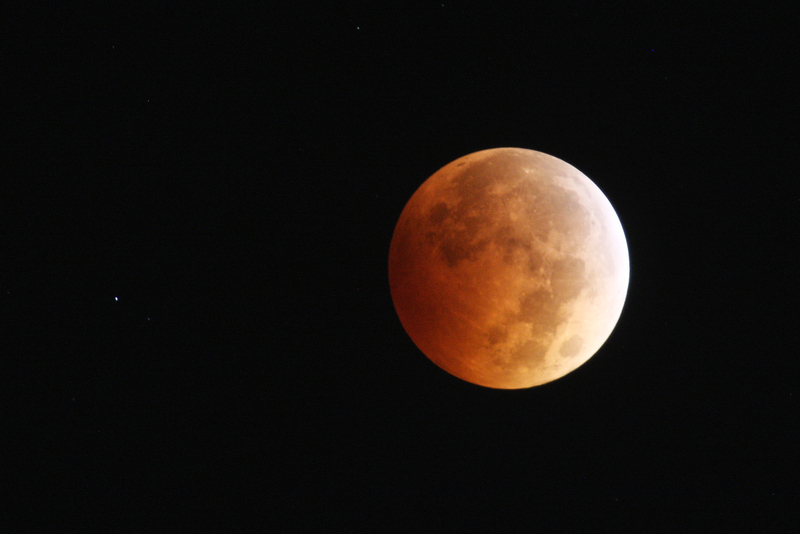 Get out and see it, because the next supermoon eclipse won't happen again until 2033, according to CNN. Unless you live in Times Square (I'm sorry) or an area surrounded by high rises, then you should be able to see the blood moon from almost any rooftop. Sure, rooftop bars can be overpriced and crowded, but seeing a blood moon with a cocktail in your hand isn't an experience you get to have every night. Try to avoid rooftop bars in areas with more light pollution like Midtown. Instead, shoot for Downtown Manhattan or even Brooklyn. If you're lucky enough to have rooftop access, head outside at various points of the night to see the eclipse in its different stages. The above ground subway-turned-garden is open until 11 p.m. Sunday night, which is plenty of time to watch the blood moon, since the total eclipse will begin just after 10 p.m. and end entirely by midnight. The moon might be blocked by view on certain parts of the High Line, but it runs from Gansevoort Street in the Meatpacking District all the way to 34th Street, so there's sure to be an area where you'll get a clear view of the moon. Central Park is open until 1 a.m. on Sunday night, so go for a late walk after dinner or, if you actually want something to do, the park is showing free summer movies. The best place within the park to get some great photos of the moon might be Sheep Meadow, which is located on the west side of the park between 66th and 69th streets. The Brooklyn Bridge is open 24 hours a day, so you could stroll part or all of the way across it to watch the blood moon. If you don't feel like walking that far, Brooklyn Bridge Park's six piers and the greenway are open until 1:00 a.m. daily. The moon rises over the East River in New York, so if you're walking along either the east edge of Manhattan or the west edge of Brooklyn or Queens, then you should be able to get a great view of the moon. Head to South Street Seaport or the East River Park if you're downtown or to the East River Walk if you're closer to the Upper East Side.